For over 2,000 years, people have been using Dead Sea mud and salt. 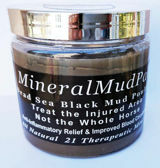 Our MineralMudPak™ is proven relief for arthritis, aches and pains. It helps relieve soreness and fatigue from joints and other body parts in both people and animals and reduces the recovery time of soft tissue injuries. Treat injured areas directly with its anti-inflammatory minerals. Apply with or without a standing wrap and still achieve positive results. Simply apply a thin layer of MineralMudPak™ on an area. Apply with or without a wrap and leave on for up to 24 hours. For those hard to wrap spots or when using on a young horse, it is best to leave the area unwrapped. You with still get the same benefits. Repeat as needed.